﻿ Bintang Flores Hotel, Labuan Bajo | FROM $71 - SAVE ON AGODA! "We felt this hotel offered great value and convenience." Have a question for Bintang Flores Hotel? "Love the beach and helpful staff"
"We stayed in Bintang Flores Hotel for 4 nights and it was a pleasant experience." "Maybe the best part of this hotel is the pool area which is adjacent to the beach." 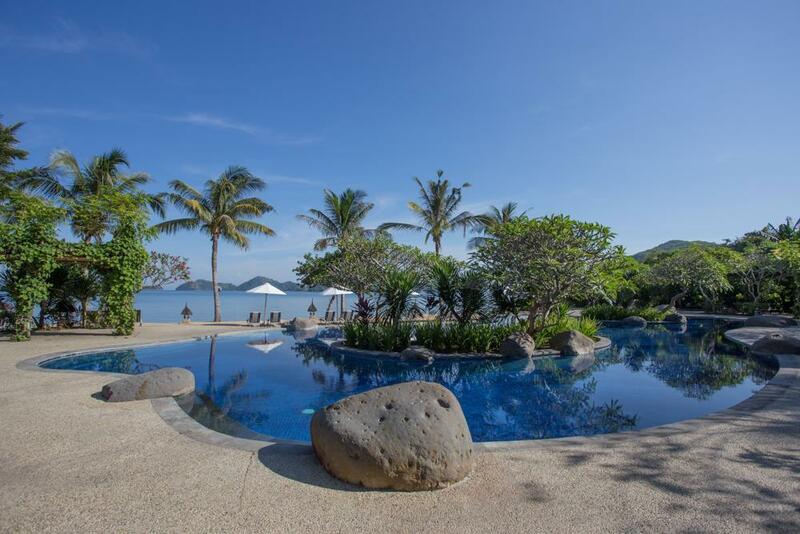 "Good size room, very clean, all facilities, good pool, and g..."
Located in Labuan Bajo, this 5-star Indonesian property offers the utmost luxury. A great place to visit, Bintang Flores Hotel offers interesting access to nearby islands like Komodo Island and features one of the best dive sites in the world. Featuring 61 elegantly designed rooms, the hotel offers satellite TV, a safety deposit box, tea and coffee making facilities, a mini fridge, an IDD telephone, and individual air conditioning. Sitting on a private beach, Bintang Flores Hotel commands breathtaking views and a refreshing ambience. Without a doubt, Bintang Flores Hotel is a great place to stay. "The staffs are all friendly and helpful during our stay." Room view requests are subject to availability. We stayed eight nights. The staff were unfailingly pleasant, friendly and helpful, and arranged taxis into town, and our cruise. The pool on the beach is great - very peaceful and warm, with lots of lounge chairs, where we were able to eat our food from the restaurant and drinks served from the poolside bar. We ate every breakfast at the hotel, several lunches, and a couple of dinners. The food was varied, with breakfast is the best, with a range of foods to suit most nationalities and tastes, and which vary from day to day. Very grateful that the kitchen staff got up early to prepare and box our breakfast for on the boat, which they helped arrange, or we would have gone hungry. Great wifi in our room - we were able to stream whatever we wanted to watch, with no interruptions. There are cheaper places at the backpacker end of the market in town, and one more expensive at the luxury end, but this is excellent value for the money, and we would stay again. If you care for a nice relaxing hotel in Bajo with value of money, this is the best choice! It's a resort hotel with a great sunset view, private beach and beautiful pool where you can relax and swim all you want. The staffs are great and the room all facing the beach. it's just great! TIP: ask for higher floor to get all the beauty of the beach from your room! We felt this hotel offered great value and convenience. The rooms were clean and spacious. The price included breakfast and bottled water each day. The staff was friendly and helpful. The pool was the perfect temperature and quite beautiful! The only issue is that the hotel is about a mile from the center of town, so you will likely have to take a shuttle or taxi for IDR50,000, luckily the hotel provides a shuttle with a little notice and can charge it to the room. Overall, a great stay! Fantastic room with garden and ocean view. Clean room, super comfortable bed, roomy bathroom,fantastic pool with a great view, helpful and friendly staff. Bintang is a clean, lovely Hotel and is value for money. It is out of town and they don’t offer a free shuttle so just be aware that you’ll have to pay each time or get a scooter. When we first arrived we were given a room with an old, shabby bathroom, but in the photos of the room we had booked it was brand new. When I asked about this the woman at reception didn’t seem to want to give us that room, but obviously I put my foot down as that was the room we had paid for. Just make sure you get the room that was advertised. Everything else though was great and in general the staff, especially at breakfast were amazing. Overall it’s a nice hotel, with decent rooms and a nice pool. BF is also ok, but nothing special. The Gym is literally just a small shelter with some equipment without any free space and the beach is very dirty and scruffy, so it’s not really a place to bath or even just stroll along. It still make it one of the nice hotels of the city if the location was just better. It’s roughly 15min away from the “city” which is not far but it’s not really a nice way to walk with traffic passing by you as you need to walk on street. In the Night there is barely any light. Hotel Shuttles are offered as an extra, but is not reliable especially during peak times. The only ways I would recommend that hotel, would be if you will rent a scooter or you are only planning do tours with pick-ups from the hotel. Great stay at what is probably what most travelers think of as a 'proper' hotel. It's got room service, reliable in-room wifi, a/c, a business center, pool, laundry services (really fast turnaround! ), it's clean, and has a bit of a rundown gym. The staff are super attentive and really want to do a good job if you can make plain your expectations. On the down side, it is about 1.5-2.0 km out of town so you will need some transport (I rented a motorbike), and the rate is a bit pricey by comparison. Was actually intending to switch hotels and move closer to town, but Bintang Flores met most of my needs. After checking out the alternatives in town, I decided to extend my stay twice. It was that much better than the other properties I looked at, plus I needed really good wifi. Noted that there is a new wing under construction on the other side of the hotel, but it didn't affect my stay at all. Great effort by this hotel, and I hope they can keep up the standards until next time! my husband and I were staying here for our honeymoon before sailing and we were really pleased with the place, the room, the pool, and the staffs. There weren't many choices for breakfast but that's okay. It's a beautiful, top notch hotel that I cannot fault anything on. Food is good: breakfast buffet has a great selection, and regular menu is good as well. Rooms were great: lovely fluffy beds, spacious and relaxing with complete amenities. Staff is excellent: youll always be greeted with the most genuine smiles and they respond ligjtning fast when there is a request. For its price, very well worth it. Stayed here after liveaboard which was a dream given the level of comfort and good service. Overall resort. 5mins drive from town is not an issue as there is nothing much in the town as well. It is much better to chill in this resort. Nice big rooms, nothing fancy. Food was decent. Location a bit outside of the main area. But the swimming pool makes it all worth it. It's a beautiful swimming pool and I would stay there again on a return visit because of it. We had a great stay and the grounds are fantastic. We especially enjoyed watching the local families who came to play at the pool. The sunsets are absolutely fantastic! The staff is very attentive and helpful. It is best to rent motorbikes for longer stays as it is a bit of a walk into town. the bedrooms were large and top quality. the pool by the sea was amazing. the staff were so helpful. Our stay was faultless and quite a surprise. What you see in photos is not always what you get. Not in this case. It was perfect. The staff were great, the rooms perfect, and the grounds and pool a tropical delight. Breakfast was generous and starts early for those heading off on the boats. Great Staff. Overpriced laundry and disgraceful hotel car hire rates. I know that things on Flores are more expensive due to import but it is so easy to compare the car and fuel costs that these rates are not justifiable. A hotel policy change om this one would be great and encourage return trips. Not my first time staying here - will I stay again? depends on value for money. The beach is totally unusuable due to litter pollution - not just here but all of Labuan Bajo - still a long ways to go in developing. Great Staff espeically in the restruant & kitchen. A visit to the local childrens re-hab is well worthwhile. bintang flores hotel is a short distance out of town on a queit beach with lovely views across the bay. the rooms are spacious and all have views overlooking the well kept grounds and big swimming pool. the bathroom was clean and well designed. the staff were very friendly, breakfast was copious and delicious meals were always available throughout the day. the hotel van was always available to take you into town at a cost of rp 50,000. i really enjoyed my three day stay there.